Canvas Printmaker Blog: Don't Leave Your Memories Behind! When Dr Vinton Cerf, Google’s Chief Internet Evangelist, proclaimed “I would say if there are photos you are really concerned about create a physical instance of them. Print them out.”, it was like music to our ears - finally someone gets it! We have been saying this for many years - print your photos out if you want to keep your most precious memories. It’s quite a refreshing stance from Google considering they ran a “Go Paperless in 2013” campaign. Between Kodak not explaining that you could print digital photos, Facebook’s convenience for uploading them and bigger and better televisions for displaying photos, the photographic printing industry has been in decline for quite some time, and yet it should be in demand now more than ever. 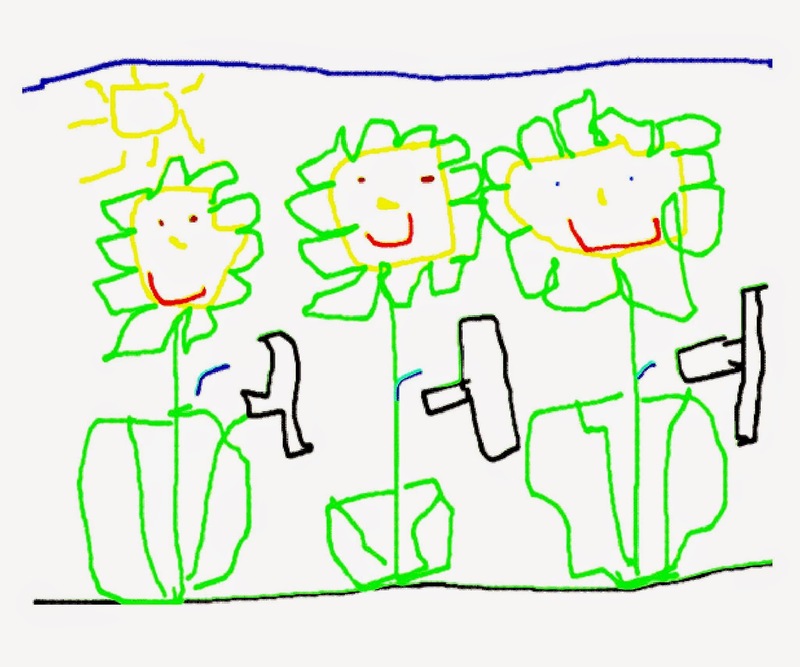 To illustrate, when my son was very young he produced this wonderfully sentimental picture of our family drawn through his eyes. The trouble was he produced it on a PC that was rather old using software which ran on an old OS - Windows ’98. It was Bill & Ben and you could have great fun playing with pipes and joining bits together to help them go through drain pipes to get to the bottom without falling off which was great fun for him (and me)! It also came with a drawing program which worked very much like Windows Paint…… and that’s when the problems started. As soon as I saw the picture I knew I wanted to keep it - it wasn’t the random mess that some kids produce. It had shape, scale, accurate colour and that wonderful way that children manage to draw pictures that all mum’s and dad’s know. Not a problem I thought, I’ll just save the file and copy it off. One whole day later I finally managed it! You see the Bill & Ben program couldn’t save the file in any standard format other than its own proprietary format. At first I thought that this would be just a case of renaming the file - it’s bound to be standard. Even with file renaming, hex editors etc. to this day I still have no idea what format it was. There was certainly nothing within the file to give any indication as to what it was. The solution finally came from printing it, but as I wanted to keep the file as well I had to figure a way to get hold of the printed file. That’s when the idea of a PDF printer driver came to mind and then many hours of searching the internet (using a terrible version of internet explorer) for some old Windows ’98 software that could do it. Many, many hours later I finally succeeded - I now had a PDF. I couldn’t view the PDF as there was no PDF viewer installed on this old clunker but at least it was in a standard format. Now to copy it off…. This should be easy but it turned into a nightmare. For starters the old PC had a floppy drive. My newer PC did not. It had a CD-ROM but no writer. Hmmmm. Aha, USB thumb drive to the rescue. Except Windows ’98 was just at the cusp of USB and it was all kind of new. The first three USB thumb drives didn’t work - wouldn’t mount them at all. Even tried FAT 16 (yuk). No joy - Ahhhhhh! Then I had the hair brained idea of removing the drive and copying it off direct in the new PC. Except it was IDE and the newer PC was SATA…. Back to the drawing board. Finally I could get it onto a modern computer to allow me to print it out on canvas. Phew! What a palaver to go through. I very nearly failed to get a readable digital version that was compatible with my modern computer and I am eternally grateful to that old USB thumb drive. It’s not just your photos that can get stuck on obsolete computers - video is just as prone. Betamax, VHS, S-VHS, VHS-C, Video 8, Hi-8, Digital 8, Mini DV, 8mm cine, Super 8mm cine, 16mm cine….. Then there are 78, 45 & 33 records, audio cassettes, slides, negatives (110, 35mm, 120, 5x4)…. And the list goes on. Fortunately we can still convert these, but I wouldn’t hang around as a lot of the equipment is old and will eventually break. At that point you’re stuck with something that cannot be read or transferred. Remember Video 2000? Or Syquest drives? Or Smart media cards. Or Firewire? And what about USB - is this the next generation of floppy disk? How long before it’s just wifi and Bluetooth? And what happens when it becomes wifi2 or whatever they call it? It still looks like it was made yesterday even after all those years - did I mention that the inks are guaranteed not to fade for decades? Oh, and then there is the protective varnish that prevents you marking it and allows you to clean it. It won’t suffer from bit-rot, or cloud providers going bust, or obsolete file formats, or hardware breakage, or viruses, data corruption….. It just hangs on the wall and reminds me that I very nearly lost my young son’s masterpiece, and it makes me smile when I see it!